The objective of the ManuCloud project is the development of a service-oriented IT environment as a basis for the next level of manufacturing networks by enabling production-related inter-enterprise integration down to shop floor level. Industrial relevance is guaranteed by involving industrial partners from the photovoltaic, organic lightning and automotive supply industries. The transition from mass production to personalized, customer-oriented and eco-efficient manufacturing is considered to be a promising approach to improve and secure the future competitiveness of the European manufacturing industries, which constitute an important pillar of European prosperity. One precondition for this transition is the availability of agile IT systems, capable of supporting this level of flexibility on the production network layer, as well as on the factory and process levels. 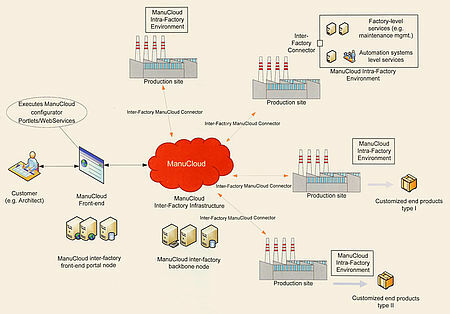 The FP7 project, ManuCloud, has been set up with the mission to investigate the production-IT related aspects of this transition and to develop and evaluate a suitable IT infrastructure to provide better support for on-demand manufacturing scenarios, taking multiple tiers of the value chain into account. On this path, ManuCloud seeks to implement the vision of a cloud-like architecture concept (see Figure 1). It provides users with the ability to utilize the manufacturing capabilities of configurable, virtualized production networks, based on cloud-enabled, federated factories, supported by a set of software-as-a-service applications. Three industries have been selected to be the initial application context for the ManuCloud concepts and technologies: The organic photovoltaic (PV) industry, the organic lighting (organic light emitting diodes (OLED)) industry and the automotive supplies industry. Each industry is driven by specific market needs. Over recent months, the market situation for the European PV industry has changed to a highly competitive environment. Prices for standard PV products have substantially dropped. China has significantly increased its market share while European companies have lost their leading position. This project will implement the ManuCloud infrastructure for the PV industry to evaluate whether highly customizable PV systems, especially in the area of building integrated photovoltaic, allow for new business models for this industry. The market for organic lighting is in an earlier stage than the PV market. However, market research predicts the development of a multibillion dollar market for these products within a few years. Due to the unique properties of large-area diffuse light generation with adjustable colors, organic lighting is expected to generate numerous new applications, a substantial share of which will be customized solutions. The project will set up and evaluate the ManuCloud infrastructure for customized organic lighting solutions. In addition to these rather strategic applications, this project is expected to have an immediate impact on the automotive supplies industry, mainly on the factory/process level components of the ManuCloud infrastructure. The ability to add new functionalities to software systems at factory level and to quickly adjust production systems to new requirements is increasingly important for these companies. With typical state-of-the-art architectures used in production, additional functionality often causes an exponential growth of system complexity. This growth of complexity significantly increases ramp-up time, risk level, and costs as well as maintenance efforts for long-term operations. Based on ManuCloud’s mission, two major R&D focal points have been selected for the project: The ManuCloud intra-factory environment and the ManuCloud inter-factory environment. The intra-factory environment is comprised of production-related IT systems within a single factory which lays the foundation to connect the factory into the inter-factory environment. The inter-factory environment serves as a market place for virtualized manufacturing services, and supports the dynamic interconnection of multiple factories for specific purposes. For the intra-factory environment, the project intends to make heavy use of cross-fertilization effects in the area of best practices, standards and technologies available in the different industries represented by the project partners. The project will consider, among others, the standards families OPC-UA, SEMI (automation) and IEC 61499. Special attention will be paid to the service interface of automation systems to the factory, including aspects of process capability modeling and system self description. A layer above the automation systems will support service discovery, management and orchestration, allowing for quick development and deployment of new factory-level services. The implementation of automation system services will be integrated with the engineering process for these systems. The inter-factory environment supports a tightly controlled, on-demand integration of federated production-IT systems of different vendors, supporting joint specification management, shop-floor data transfer, high level of traceability and distributed quality management. This functionality will be provided by the ManuCloud Manufacturing as a Service (MaaS) environment. A front-end system will support the dynamic configuration of virtual production networks and provide interfaces for product configurators, which are supported by a product design & manufacturing advisory subsystem. Demonstration scenarios will be setup for PV and OLED lighting use cases.